The living room in our Blue Cottage is coming together. We still need curtains and I’m keeping my eyes out for two small chairs I want in front of our trunk coffee table, but today I finished decorating out mantel. 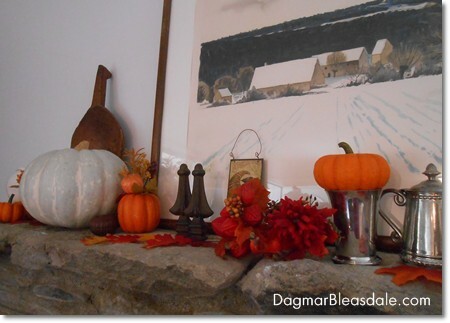 I’ve never had a mantel before, and I’ve really been looking forward to being able to decorate it for every season. I wish the lighting in these pictures would be better, but we’re surrounded by so many trees that the whole house is pretty dark, and I didn’t feel like dragging lamps downstairs. There are many more pressing things that need to be finished first, but I’d eventually love to encase the top of our fireplace with wood to have a straighter surface. 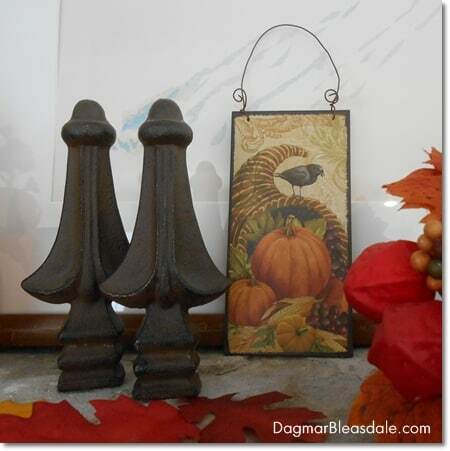 It’s such a big fireplace, I think it will look great with a chunky mantel. I’m deciding between white-washing the wood or dark wood, what do you think? This wooden shovel is from Saturday’s tag sale — I paid $3 for it. And this is what the whole fireplace looks like. 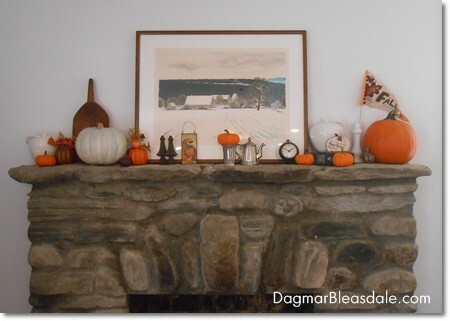 Your mantle looks great for fall! Thank you for sharing on Idea Box! Very rustic looking! I like it! 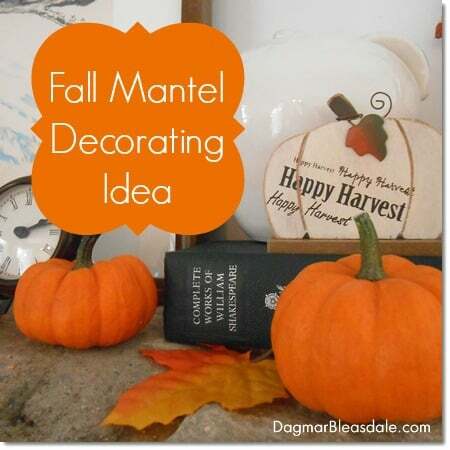 I am in the process of making a faux fireplace and can’t wait to have a mantel to decorate! Thanks for sharing! 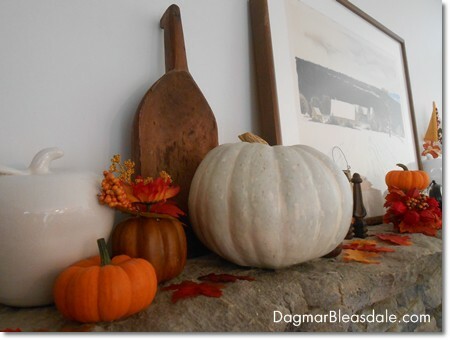 Hi, Dagmar, really pretty fireplace surround, the rustic stone is so nice. 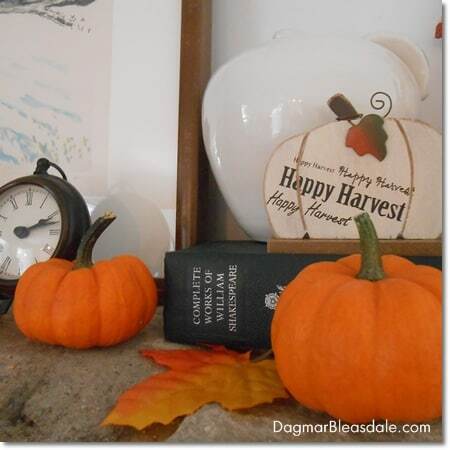 And your Fall additions make you ready for the season. I hope you are loving your blue cottage, so happy for you. THanks as always for stopping by! 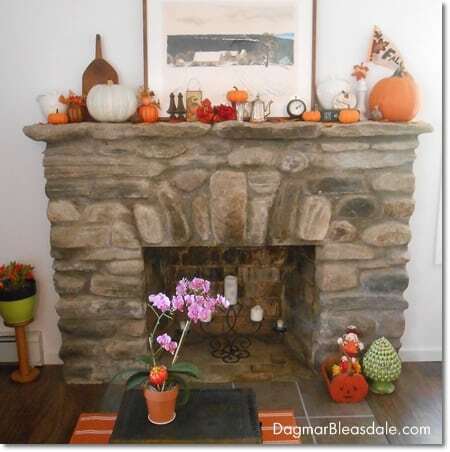 What a great stone fireplace. When you put a mantle on it I would do it white.